2. What is Brand Voice and Tone? 5. How Video Helps in Establishing Brand Voice. Investing in branding is as important as investing in the product’s development. Without branding, your brand might not last that long. People recognize a product with its brand. A Brand creates following, fans and a long-lasting image in consumer’s mind. To create a brand out of product, companies must invest in the right strategy and channels. Companies that ignore branding to focus on only customer acquisition face problems like higher churn rate, very few or no loyal customers, weak word-of-mouth marketing, vague and inconsistent brand image, and more. All of these issues plague the growth and threatens the existence of a product or a company in the long run. To create a brand that your customers can associate with, you need to focus on two crucial aspects. First is the visual image and second is the voice and tone. While many companies put a lot of efforts and money in the visual part by creating memorable logos, attractive packaging and beautiful websites, some of them forget to focus on the voice and tone of their brand. The result in inconsistent brand messaging across channels confuses not only customers but prospects as well. Just like a human being, a brand has a personality and emotions that are expressed through its messaging. Whenever a brand communicates with its audience through any medium, such as social media, website, ads, etc, its messages are infused with particular personality and emotions. These things help build a certain image of the brand in a consumer’s mind. Having a unique and consistent brand voice is important because it differentiates it from other similar brands available in the market. It helps a brand cut through the clutter of ads and noise to make an everlasting impression on the customers. A Brand’s voice is derived from its vision and mission. An effective brand voice is established when it is consistent and clear across the channels. If a brand voice changes every time it communicates with the audience, it will confuse them and your efforts will fail miserably. Similar to brand voice is its tone. While brand voice remains consistent, the tone might change with the context or emotion of the message. Nike puts a lot of efforts behind its brand image. It has a well-established brand voice and tone. In every messaging of Nike, you will notice a consistent brand voice, which is inspirational, motivational and confident. Another example of an established brand voice is Apple. Apple has a brand voice that is simple, clean and declarative. This is also apparent through their product design, packaging, web design, and other brand assets. Establishing a brand voice starts with the values. The brand voice must be a reflection of values followed by your brand, which are usually present in a mission statement. It will make your brand’s purpose clear and will help you in creating a voice that represents and communicates the values. Define your brand personality, voice or traits in three words. Create a chart which should mention the traits, a brief description of each of them, the dos and don’ts of how to use them. To establish your brand’s voice, you must be consistent in the messaging throughout your marketing campaigns. All the marketing channels must communicate the message in a consistent voice. There are a lot of marketing channels that will help you establish your brand’s voice. However, one of the most effective of them is videos. Videos have become a useful tool in brand storytelling. According to a study, more customers prefer to watch a video about a product instead of reading about it. This makes sense because videos make it easy and quick for viewers to consume the content. Videos also give visual freedom to companies in representing their brands and connecting with the audience through powerful emotions. Through visual stimulating graphics and sound, companies can deliver their brand’s message in a voice and with emotions they want. This makes even a 10-second video effective in increasing brand awareness. It also makes videos ideal for establishing a brand voice. Since storytelling through videos is quite compelling, it makes sense to use videos to communicate your brand’s voice. This is because in videos you are not just limited to text and images, you can show people doing actions and you can add sound or music to it. All of this can be integrated to create a brand storytelling experience that will communicate your brand voice to your target audience. 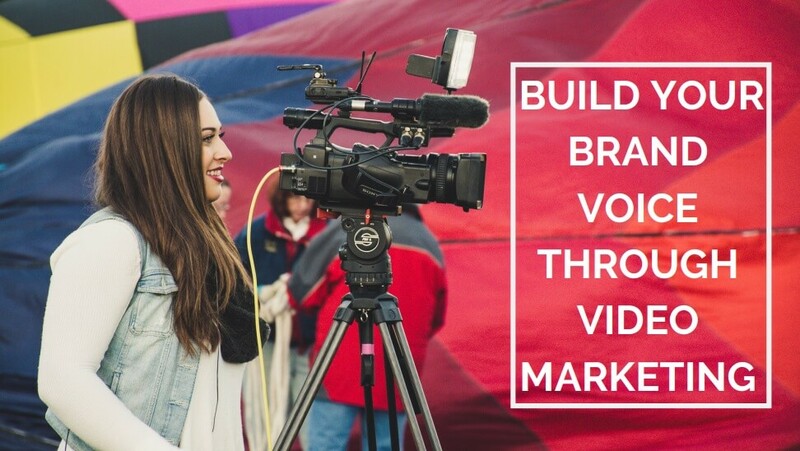 Here are some methods of using videos to establish a brand voice. You may have already been advertising your product or service through video channels. However, analyze whether you have been consistent with your brand voice in all the videos. This means the theme of the video, whether it matches your brand’s personality. The message you are communicating, does it matches your brand’s voice? Engaging with its customers and community is essential for a brand because it is an effective method of communicating their values directly. Brand’s can engage with even more audience if they create a video of their engagement and activities. Here is a video of Coca Cola’s happiness campaign that demonstrates the effective customer and community engagement is in communicating brand voice. If you want to connect with your customers and prospects, you should create videos that have the right kind of emotions that are not only associated with your brand but are also relatable for customers. This only possible with a great storytelling experience, which will also help in communicating the brand voice. Establishing a consistent brand voice is important if you want your audience to remember your brand and make it distinguishable from others. Otherwise, your brand will be lost in all the clutter and will be unable to attract lifetime customers. Does your company use videos to build their brand?